I decided I couldn’t handle a trip down memory lane into the Dark Night of the Soul quite yet, and one of the joys of writing a book as a blog is you can duck into side alleys if you wish. So I’ve veered off route to look at the good side of life on Mt French which was our motley collection of various animals and chooks, as well as unexpected close encounters of the snake kind, big spiders, large lizards, fruit bats, paralysis ticks, straying cows, dingoes, frogs, eagles, various birds, echidnas and kamikaze mosquitoes. Yemaya Dreaming – a tribute to the African goddess of the oceans, but as this post has so much about snakes, I thought I pop it in! When we arrived in Queensland, we had our three cats and one dog picked up by kennels north of Brisbane so, once we’d moved into our new home, I drove up to pick them up while Bryan continued sorting the house out and fencing our 1-acre property to keep Rosie, our Jack Russell in. It was a hot day and the air was thick with smoke from the various bushfires burning around Ipswich (a city to the west of Brisbane) and Brisbane itself. As I drove along the freeway leading to Brisbane, the smoke was so thick you could hardly make out the signposts overhead. And as it was quite difficult to head in the direction of the kennels (no freeways that far north in those days), I duly got lost and ended up very hot and sweaty by the time I reached my destination. It was brilliant being reunited with our pets: Rosie settled into her crate in the front seat and fell asleep. On the other hand, in the back seat, two of the cats – Smudge and Daisy – were fine but Jessie got car-sick and I’d forgotten how bad she used to be. The car stank of poo, pee and vomit as I headed home in the heat and it was an enormous relief to stagger out of the car and breath in the fresh, cool air of the mountain when I got home. Rosie loved her new home and all it’s space to race around in. We kept the cats in for a week to get them acclimatised and, once released, they stayed close by and settled in. We also kept the cats indoors at night to protect the native wildlife as cats are big killers of local animals, particularly at night. As we’d lived in suburban Perth we had no idea of the wildlife awaiting us in sub-tropical Queensland. Our first hint that life would be different was when Bryan strolled in and said he’d found a brown snake with its head down a hole, tweaked its tail and ran like hell as it shot out of the hole. Browns, king browns, red-bellied blacks, taipans and various other slithery creatures inhabiting our environment are extremely poisonous – Australia has a myriad of deadly snakes which leave the rest of the world in its wake. I saw Daisy chasing a brown snake once and was amazed at its speed. Luckily for Daisy I yelled for her to stop just as the snake turned around to attack her and, as she turned towards my voice, it took the opportunity to literally leap away in huge loops of its body. It helped me respect people’s advice to leave snakes along and they’ll leave you alone. I forgot this when I was at home on my own one day while Bryan was down in Boonah doing the shopping. The cats and dog suddenly began making really weird growls and hisses, so I looked outside and there was a python stretching out from our side fencing and heading onto our roof. Well, I had no wish to have a biggish snake wandering around on our roof and perhaps dropping on my head so I grabbed a broom, locked the animals inside, and rushed out to poke the snake and send it back where it came from. Unfortunately, it didn’t quite work like that. The snake moved really quickly, swung around towards me, I screamed, dropped the broomstick and ran inside. I think my hair may have been standing on end! I kept an eye on the snake and it finally returned to the thick jasmine creeper on the corner of our patio where it blended so well you would have no idea a python was coiled up inside. 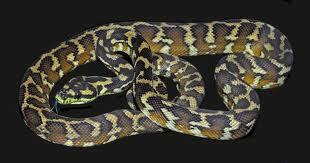 Bryan came back shortly afterwards and strolled past the jasmine, quite oblivious to the python lurking inside. “How big was it?” he asked. “Oh, about six feet, I think,” I replied. Until I had to change my mind about the size a short while afterwards. Bryan had grabbed a roll of vinyl from where we’d stored it on the front verandah as we were going to re-vinyl the kitchen floor. He walked through the house with the vinyl over his shoulder to the flat part at the back to cut the roll to size. I suddenly heard a yell out back so ran out, to see a rather groggy looking carpet python staggering away from the vinyl. My husband had slipped his hands inside, started unrolling the vinyl but at the final roll came in contact with the snake’s body. Luckily, it had been asleep and was a bit dopey at being rolled over and over, but carpet pythons aren’t venomous although they can give you a bit of a bite. I asked Bryan how long he thought it was. “Oh, about six feet, I suppose” he replied. And I instantly had to up the size of the carpet python I’d poked with the broom. It was twice as long as the snake in the vinyl and much wider, so I guess I’d mixed it with a 12 ft python. I was just glad I hadn’t realised how big it was at the time! I came home from shopping one day to find Bryan looking a bit shaken. He told me the curtains on the verandah doors had been moving so he’d swept them back, thinking a gekko had got in, only to find himself eyeballing a snake. He grabbed Rosie and locked her in a bedroom but, luckily, when he got back he saw the snake disappearing down the verandah – it had been chased away by feisty old Daisy! A few weeks later we were in a shopping centre close to Ipswich and saw a wildlife display with a ranger in attendance. Bryan leaned forward, pointed and said: “Hey, that’s the snake I saw in the house.” We were quite casual about it until the ranger said: “Oh, that’s a taipan”. 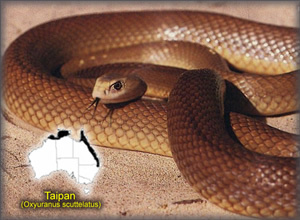 Now, you may not know taipans but they’re one of the world’s deadliest snakes, large, highly poisonous (the third most deadly while the inland taipan is the most deadly) and extremely aggressive. They won’t steer clear of you, they’ll actively attack you. So we looked at each other, both going a bit pale. threatened they’ll attack and bite. Luckily no-one has died since an anti-venene was developed but I remember, back in England before I’d moved to Australia, reading about a woman in Sydney who’d been bitten and who had died very quickly. 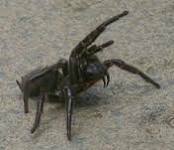 So, as you can imagine, we returned to what we’d thought was a home in paradise, looking cautiously around for anything looking remotely like a taipan or funnel web spider. Luckily we mainly saw the odd carpet python and quite a few tree snakes which, while venomous, can’t open their mouths wide enough to bite a human. But we did hear screaming one night and quite a big green snake had caught a frog and was swallowing it. We had to accept it’s nature but it was really rather horrible, hearing the screaming getting muffled until finally there was silence. I think we looked as green as the tree snake! as they were great at catching flies and mozzies, but if they were on the wall beside the pillow we’d pop them in a glass then release them outside. 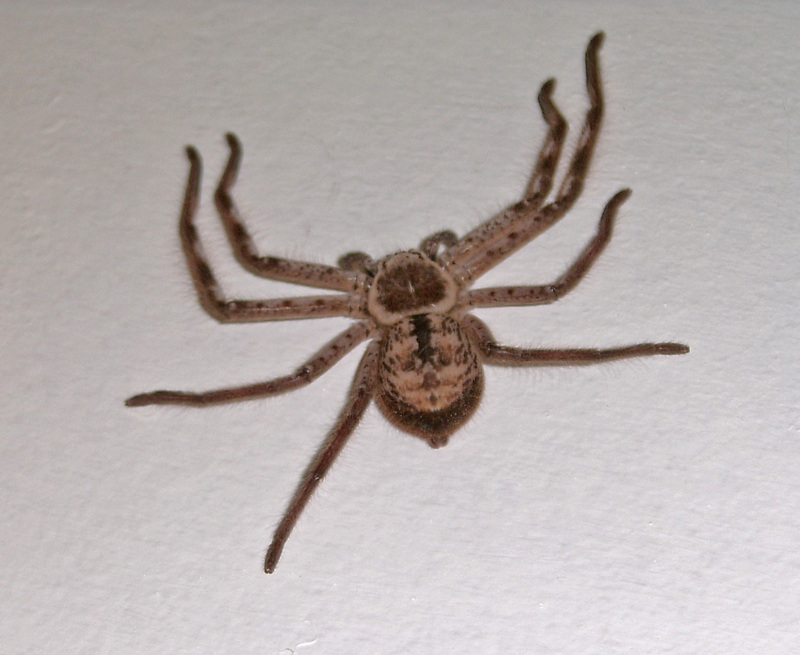 One night I got up to use the bathroom, switched on the light then let out a screech as a big huntsman was sitting right beside the switch. A centimetre further and I would have poked the spider. The spider jumped an inch off the wall and, unfortunately, went absolutely troppo, running around the walls of the toilet while I tried to get finished as quickly as possible while keeping an eye on the manic spider. We also used to get green frogs climbing up inside the toilet. It was a hell of a shock the first time I went in and saw a couple of dirty great green frogs calmly staring back at me from the rim. I got Bryan to catch them and put them outside but one night I had to handle one myself. I heard a screeching, the dog barking and the cats yowling so got up, only to find the mutts sitting in a circle around a frog which was keeping them at bay with its screeching. I knew if I didn’t fix it, the noise would continue all night. It was mid-summer with really hot nights so both of us slept starkers which was lucky, I guess, because when I picked up the damned frog to put it outside, it peed all over me. Luckily with no clothes I was able to wash myself down. And my dear husband slept right through the racket and was quite surprised to hear about the kerfuffle the next morning! So here’s a hint – if you want to chuck a frog outside, fling a towel over it first to catch it, as it’s a damned sight easier to chuck a towel into the washing machine than it is to wash yourself down!